Certain protocols in relation to the Philippine national flag and the presidential flag were breached during Chinese President Xi Jinping’s state visit to the country. Historical researcher Eufemio Agbayani III of the National Historical Commission cited instances wherein the Chinese flag seemed to take precedence over the Philippine flag. Under Section 18 of RA 8491 or “The Code of the National Flag, Anthem, Motto, Coat-of-Arms and Other Heraldic Items and Devices of the Philippines,” the Philippine flag should always be displayed on the left side when it is with a row of foreign flags. However, there were instances wherein the provision was not followed during the first day of the Chinese president’s visit. During the witnessing of the exchange of agreements held in Malacañang Palace, the Chinese flag was the one seen on the leftmost side of the row. During the bilateral meeting between the two countries, the Chinese flag was the one displayed on the leftmost side of the row. When Xi participated in the wreath-laying ceremony in Rizal Park, the position of the flags were changed to follow protocol. In the first moments of the ceremony, the Chinese flags were displayed on the left side of Rizal’s monument following an observer’s view while the Philippine flags were on the right. But a snapshot taken by a local media outlet showed that at some point, the positioning of the flags was changed. The Philippine flags were placed on the left side, as what the law originally dictates. P.S. It’s not like we can’t correct it. On this very same day, the Rizal Park management fixed the flag arrangement so that the PH flag is on the left and the CH flag is on the right. It was not the first time that the current administration has violated flag protocol. When Chinese officials of the National People’s Congress paid a courtesy visit to House Speaker Gloria Macapagal-Arroyo, the Chinese flags were hoisted on the left side of Batasang Pambansa Complex. 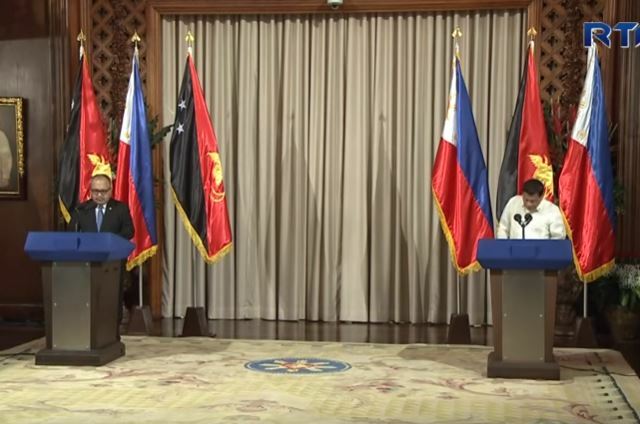 During the official visit of Papua New Guinea Prime Minister Peter O’Neill, the flag of the Philippines was not placed on the leftmost side. The same case happened in the official visit of Japanese Prime Minister Shinzo Abe, where the Philippine flag was not placed in the leftmost side as well. A look at the arrangement of Philippine flags with foreign flags in the previous administration showed that the former was usually at the leftmost side. When former United States President Barack Obama went to the Philippines for a state visit, the Philippine flag was at the left. The same arrangement was followed when former Thailand Prime Minister Yingluck Shinawatra visited Aquino as well. Facebook page “Philippines Defense Forces Forum” also observed that the Philippine presidential flag of the country was not present during the welcoming ceremony for Xi in Malacañang Palace. The presidential flag is blue in color and it bears the coat-of-arms of the president. It is for his exclusive use and is meant to represent his dignity and authority as the head of the state. It is usually carried when the president attends welcoming ceremonial honors—specifically during the inspection of military troops—to assert his position as the commander-in-chief of the Armed Forces of the Philippines. However, the current administration withdrew from the protocol when an honor guard carried the Chinese flag instead of the standard presidential flag. The same case didn’t happen when Duterte attended the official welcoming ceremonies for Japanese Emperor Akihito, Japanese Prime Minister Shinzo Abe and Indonesian President Joko Widodo. Former Presidential Communications Undersecretary Manuel Quezon III shared in a tweet that presidents can break traditions in such cases. Unlike the arrangement of the Philippine flag, the presidential flag is not bound by any republic act but rather, by an executive order. The establishment of its use was initially decreed by former President Manuel Roxas under Executive Order 38 (series of 1947) and later on amended by former President Gloria Macapagal-Arroyo in Executive Order 310 (series of 2004).